Emmonak is a Central Yup'ik Eskimo village located at the mouth of the Yukon River on the north bank of Kwiguk Pass. Emmonak parishioners of the 1950's came from the Black River area. The village had to be relocated in 1965 due to seasonal floods. The new village site for Emmonak was located 1.4 miles to the north. For generations the people of the Black River area had been visited by priests stationed at Akulurak, now an extinct village. Fr.Segundo Llorente, S.J., once built a church in the old village and was resident priest there from 1953 until 1963. After moving from old Kwiguk to Emmonak, Fr. William McIntyre, S.J., then pastor, built a new church at Emmonak. Emmonak has since seen few resident priests. Most priests are visitors from Nunam Iqua (Sheldon Point) or Kotlik. The following Jesuit priests served Sacred Heart parish over the years: Frs. Francis Nawn, RenÃ© Astruc, James J. Strozk, Henry Hargreaves, and Thomas Provinsal. Diocesan priest Declan Caulfield also served (1994-1995). Resident deacons tended to the spiritual needs of the Catholic community during the priests' absences. 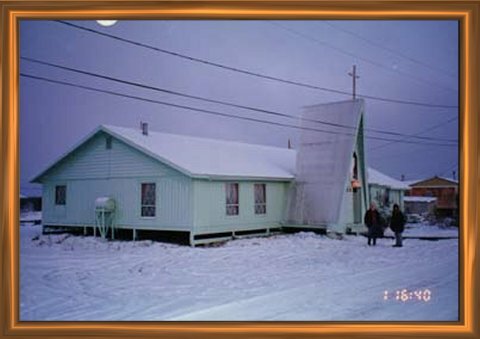 On August 6, 2000, the most Reverend Michael Kaniecki, S.J., who was Bishop of the Diocese of Fairbanks for 15 years beginning in 1985, died of a heart atttack at Emmonak before he was to confirm candidates at Sacred Heart Church.